Good news coming in from Tomenosuke about their exclusive KillKat! News flowed when the exclusive would be released at STGCC 2018 leaving non-attendees to bang on the doors of Tomenosuke and Andrew Bell. The newly crowned DTA Toy of the Year Kill Kat by Andrew Bell has released more photos of KillKat “Too Much Sake” Tomenosuke exclusive’s wonderful packaging and the exclusive first full reveal. KillKat has a bad hangover? HA, what an expression. Changing the eyes on one half was a smart move! Love it, best hangover cure is SLEEP, HA. 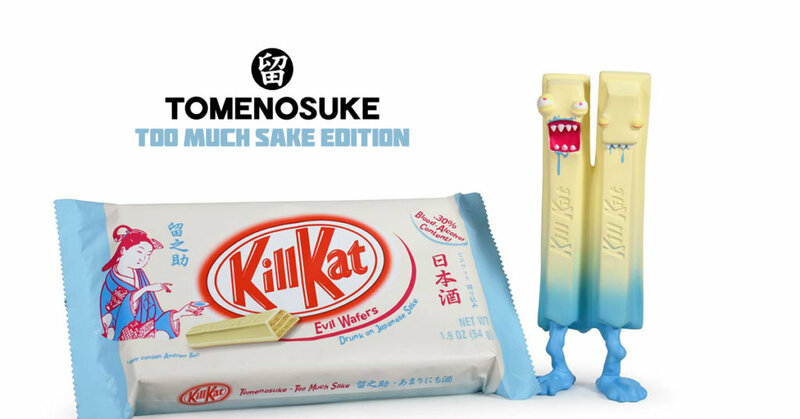 Lovin the inspiration behind Tomenosuke exclusive, with the lovely art on the package which matches Japanese love for Kit Kat’s (yes they do have a sake flavour) Anyway getting back to the release info. Here’s what Tomenosuke had to say about the exclusive. KillKat “Too Much Sake” Tomenosuke Exclusive was introduced in the August 17th, 2018, blog and resulted in a huge number of inquiries. Most of these inquiries were about concerns that it would be sold out in STGCC 2018 and if there would be a chance for Andrew Bell fans in Japan to purchase them. There is no need to worry. Of the 150 limited-edition units, only 50, one-third, will be taken to Singapore. *UPDATE* On September 12th, sales will begin simultaneously in Tomenosuke STORES for Japan and Tomenosuke International for overseas. At 20:00 Japan time. Price is 5,800 JPYA small amount will also be reserved for DCon in November and Tokyo Comic Con in December.